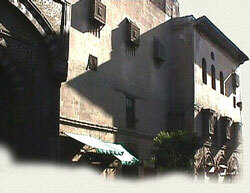 Building Type Palace "House", "Qasr"
Qasr Bashtak whose main facade on Sharia al-Muizz is identified by Mashrabiya windows is a unique example of fourteenth century domestic architecture and the best existing preserved palace of its time. Its owner, Bashtak, was the son-in-law of Sultan al-Nasir Muhammad and one of the most powerful amirs of his time. A lozenge-shaped blazon indicating Bashtak's title, that of Master of the Robes, is embedded in the masonry of the side facade above the entrance archway.